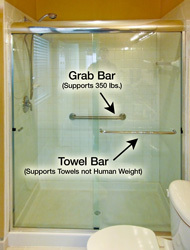 A grab bar is always mounted to a wall, not a glass shower door. It's engineered and tested with quality fasteners to safely support about 350lbs, without pulling way from the wall. Grab bars, also known as assist bars, are installed to help an individual easily and safely exit or enter a shower or bathtub. 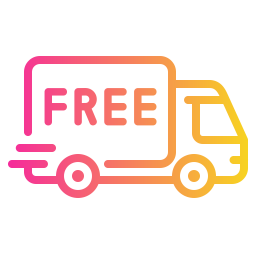 Though most commonly used to help those who are disabled or elderly, grab bars are useful for any shower/tub situation that is particularly slippery or steep. Assist bar placement is very important, so be sure to consult your glass professional before installation. A towel bar is often mistakenly used for support. When you have to grab hold quickly, anything will do. But it is not designed or installed to support human weight. If mounted to a shower glass panel and yanked loose, the glass will most likely shatter.